It is now common knowledge that vampires can turn into bats but prior to Bram Stoker’s seminal 1897 novel Dracula the connection was not so obvious. Dracula (and, sometimes, the films based upon it where they have diverged from the novel) solidified popular knowledge regarding vampire lore. Bram Stoker’s Count could, most certainly, turn into a bat “he can be as bat, as Madam Mina saw him on the window at Whitby” (Stoker, 1897, p. 339) and also command them, “he can command all the meaner things, the rat, and the owl, and the bat, the moth, and the fox, and the wolf”. (Stoker, 1897, p. 336) But where did Stoker get the idea to tie the bat and the vampire together? It is perceived wisdom that this was totally Stoker’s invention but this essay shall question that wisdom. We are unsure whether Stoker looked at the 1888 Encyclopedia Britannica, though there is a good chance and so Eighteen-Bisang and Miller include it as an appendix to the notes for Dracula. (Stoker, 2008, pp. 306–8) What is interesting about the entry is that, whilst it does examine the Slavic myth, the bulk of the entry is about vampire bats. We are fully aware, however, of a press cutting taken from the American newspaper the New York World, dated Sunday 2nd February 1896. (Stoker, 2008, pp. 187–93) The cutting itself was kept amongst Stoker’s notes and is primarily concerned with the vampire phenomena, specifically the New England vampire phenomena through which many corpses were unearthed and treated as vampires through the 19th Century. However the final section of the article, again, concentrated on vampire bats. How much of an influence this would have had is debatable, after all the bat section is only two paragraphs long. (Stoker, 2008, pp. 191–3) We do not know how Stoker came across the cutting, if he found it whilst in America it is likely to have been during his trip to New York in the winter of 1896 (Stoker, 2008, p. 187) and thus Dracula would have been largely complete. Stoker (probably purposefully) misidentifies the small vampire bat with one of its larger cousins. So, if not in Stoker’s explicit notes and research, where else did he get the connection between vampire and bat? One explicit connection between bats and vampires is found in later editions of Sir Richard Burton’s Vikram and the Vampire. It seems unlikely that Stoker wasn’t aware of Vikram and the Vampire and there is a potential that he had read it, whether he had read an earlier edition or the 1893 edition is, of course, unknown. Incidentally Sir Richard Burton is sometimes cited as a potential inspiration for Count Dracula due to a specific physical characteristic. “The Irish Vampire.” Punch (October 24, 1885). The vampire seemed, within the Western European consciousness, to settle easily into its role as metaphor. 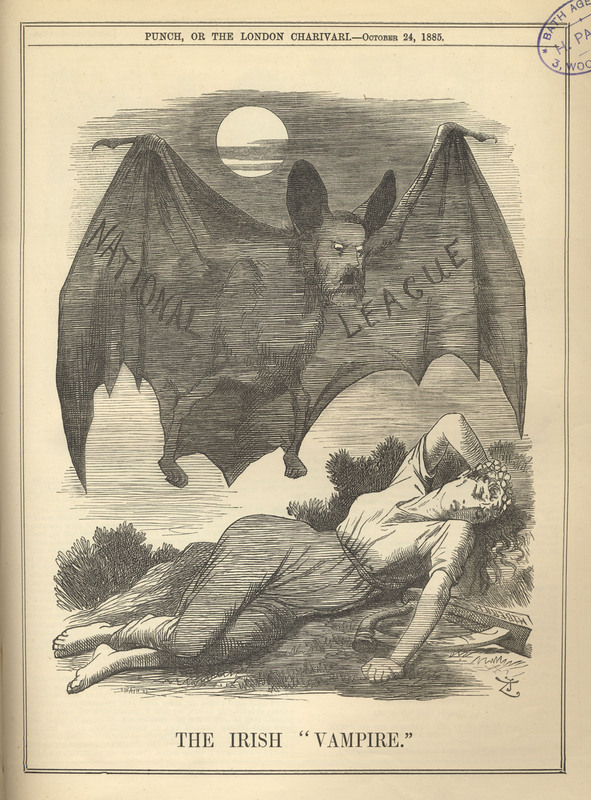 It should come as no surprise then that in 1885 Punch magazine used the vampire as symbolic of the Irish National League. 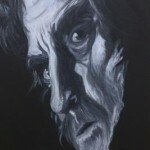 However the vampire form they chose was the bat (replete with human face) titled with the words “the Irish Vampire”. This tells us again that the bat and vampire were commonly conflated—though whether the driving force of this conflation leaned was more to the folkloric walking corpse or to the South American Chiroptera is not clear. However, I would offer the supposition that Stoker, an Irishman by birth, would have been aware of the National League and that it is not beyond the realms of possibility that he was aware of the Punch cartoon. That cannot be proven, of course, and were it the case we cannot say that it consciously influenced him. Goya – Disasters of War – Las Resultas. 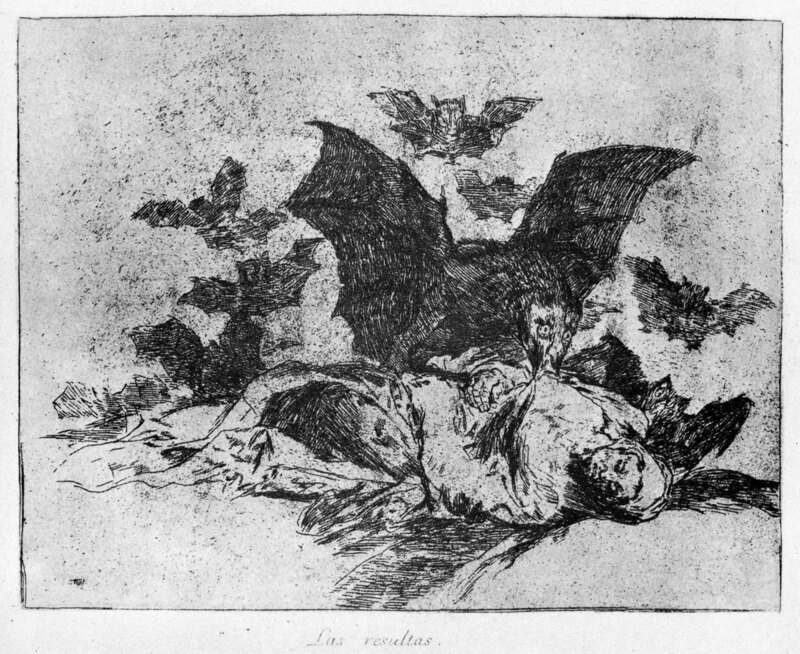 A bat with an anthropomorphised face was also used by Goya in one plate from “The Disasters of War” series. The sequence of prints were created between 1810 and 1820, though publication was posthumous and as late as 1863. The plate in question was number 72 and was entitled the Consequences (Las Resultas) and shows a bat with a humanoid face suckling on the chest of a corpse. The obvious modern association would be with vampires though, looking back to a Victorian reaction, we can only safely say that it ties bats with death and feeding upon humans. We cannot, of course, assume Stoker knew the print. It is unknown whether Stoker was aware of the works of Alexandre Dumas, père, but the author and playwright is one of the most famous literary figures from his native France. With Stoker’s position within the London theatrical arena, as acting manager and then business manager of Henry Irving’s Lyceum Theatre, it seems that he would have at least passing knowledge of Dumas. Did he know that Dumas had written a play that was the sequel to John Polidori’s The Vampyre: A Tale (1819) entitled The Return of Lord Ruthven? We cannot say but it is interesting to note that Dumas actually gave Ruthven, the vampire of the piece, wings. Act III of the piece was designed to be a visual experience for the audience, which displayed the resurrection of a vampire. It may well be that it is a modern conceit to assume that those wings would be bat wings—the script is silent—however this author certainly does not feel they would have been angel wings. Giving the vampire wings was not restricted to Dumas’ play. The story, “Pepopukin in Corsica,” was published in an anthology called The Stanley Tales in 1827 and was attributed to “A. Y.,” who Andrew Barger assumes to be Arthur Young (1741–1820). What this story and Dumas’ play show is that there was some thought that vampires could fly and could have wings. The production of wings is one thing but what about full transformation into a bat? At the head of this essay I stated that the perceived wisdom is this was invented by Stoker within Dracula, but that is not the case. In fact, such a transformation was mentioned in the short story “The Vampire; or, Pedro Pacheco and the Bruxa,” which was written by William H. G. Kingston and published in his 1863 volume, Tales for All Ages. The story uses a basis of Portuguese lore, and the author sets out the lore before the main story begins. Bruxa are female, possessed by an evil spirit and the daughter of a Bruxa will become one in her turn. Again, admittedly, we do not know if Stoker was aware of the story but, even if not we can now say that the transformation of vampire into bat was not his original invention. One author that Stoker was certainly aware of was Sabine Baring-Gould as he used his 1865 volume, The Book of Were-Wolves, as part of his research for Dracula. (Stoker, 2008, p. 129) In fact Stoker’s description of Count Dracula owes much to this volume. It should be remembered that religious art had already made a distinction between the wings sported by angels and those belonging to the devil by making the devil sport bat wings. This can be illustrated through paintings such as the painting of Saint Michael by Carlo Crivelli, dated to around 1476. It would seem, then, a logical leap to have the wings of the vampire, Dracula, as bat wings (indeed having him transformed fully into a bat) as Stoker connected his character with the Devil. His choice of the name Dracula was based on the entry about the Voivode of the same name in William Wilkinson’s An Account of the Principalities of Wallachia and Moldavia (1820). This is known as the entries are transcribed into his notes and this was the only book we know he consulted that mentioned the historic Dracula. Famously the devil, in the form of Mephistopheles, appears in the story of Faust. There is a vampire connection through the French author Paul Féval as, in his 1856 volume, The Vampire Countess, he mentions a (most likely fictional) three part book. The books story is then described as following the characters Faust and Marguerite. Whilst Goethe’s version of Faust contains the female character of Gretchen, the opera based upon it contained libretto by Jules Barbier and Michel Carré in which the female character is called Marguerite. Féval suggests “What is Goethe’s masterpiece, after all, if not a splendid exposition of the eternal fact of vampirism – which, since the beginning of the world, has emptied and dried up the heart of so many families?” (Féval, 1856) Faust, in Féval’s imagined work, is the vampire. Stoker was very aware of the Faust story as Irving famously played Mephistopheles in Faust; in fact the run of the play (at the Lyceum and on tour) saw 792 performances and made over quarter of a million pounds in receipts. (Stoker, 1906, p. 113) Whether he was aware of the connections between Faust and vampirism that Féval made, whilst unknown, is unlikely, but perhaps he knew of another Frenchman’s adaptation of Faust. In 1896, Georges Méliès made a short film that showcased trick photography called Le Manoir du Diable. Now, my reason for the supposition that Stoker was aware of this film is that firstly film and the stage are obviously related, secondly that the film featured Mephistopheles and finally that Stoker was enamoured of new technology—he included cutting edge technology in Dracula and actually strayed into science fiction in his later novel the The Lady of the Shroud (1909). I am not suggesting that the idea of the transformation from human to bat and the act of warding evil via the cross was added into Dracula because of Le Manoir du Diable—the film preceded the novel by a year but Stoker had been researching and writing his novel for at least six years at that point. However I do feel that he might have been aware of the film. None of the evidence, beyond what Stoker penned himself in his novel, his notes and his reminiscences, can be definitively tied into the creative process of Dracula. However what we have seen is a rich pre-Stoker connection between bats and vampires that might be obscure to modern eyes but are suggestive that the connection between bats and vampires was already established to a greater or lesser extent in the public mind. Certainly Stoker was not the first to suggest that a vampire could transform into a bat. The best that can be said is that he popularised the connection. AY, 1826. Pepopukin in Corsica. In: A. Barger, ed. The Best Vampire Stories 1800-1849. electronic – kindle: Bottletree Books LLC. Barger, A., 2012. The Best Vampire Stories 1800-1849. electronic – kindle: Bottletree Books LLC. Baring-Gould, S., 1884. Margery of Quether. In: R. Eighteen-Bisang & R. Dalby, eds. Vintage Vampire Stories. New York: Skyhorse Publishing, pp. 59–103. Burton, I., 1893. Preface – Vikram and the Vampire. [Online]. Available at: http://www.sacred-texts.com/goth/vav/vav02.htm [Accessed 8 February 2014]. Burton, R., 1870. Vikram and The Vampire. [Online]. Available at: http://www.sacred-texts.com/goth/vav/index.htm [Accessed 8 February 2014]. Dumas, A., 1849. The Pale Lady. 2013 ed. s.l. :Read Books Ltd.
Dumas, A., 1851. The Return of Lord Ruthven. 2004 ed. Encino: Black Coat Press. Féval, P., 1856. The Vampire Countess. 2003 ed. Encino: Black Coat Press. Kingston , W. H., 1863. The Vampire; or, Pedro Pacheco and the Bruxa. In: R. Eighteen-Bisang & R. Dalby, eds. Vintage Vampire Stories. New York: Skyhorse Publishing, pp. 9–18. Marx, K., 2004. Capital. In: Selected Writings. s.l. :CRW Publishing, pp. 141–394. Stoker, B., 1897. The New Annotated Dracula. First (2008) ed. New York: W W Norton & Company. Stoker, B., 1906. Personal Reminiscences of Henry Irving. revised (1907) ed. London: William Heinemann. Stoker, B., 2008. Bram Stoker’s Notes for Dracula – a Facsimilie Edition. Jefferson: McFarland & Company. Voltaire, 1901. Philosophical Dictionary Part 5 (1764). In: The Works of Voltaire, A Contemporary Version: A Critique and Biography. New York: E. R. DuMont. Andy Boylan writes Taliesin Meets the Vampires, a vampire movie and book review blog—which should be an essential item in your reading list. He has also written a novel, Concilium Sanguinarius (2008), and a non-fiction work called, The Media Vampire: A Study of Vampires in Fictional Media (2012). Previous article Why Has True Blood Been So Successful?